Nodosaurs were tank-like dinosaurs, similar to ankylosaurs, covered with spiky scales and a pair of two-foot-long spikes—one protruding from each shoulder. Miner Sawn Funk encountered one during 2011 in Alberta’s Millennium Mine. The fossil turned out to be the best of its kind. No technical reports yet describe the specimen, but researchers have learned enough during the past six years of its painstaking preparation to suggest that it holds plenty of secrets about dinosaur life, death, and preservation. For example, it still has preserved skin remnants on its face and toe pads. The museum placed the nodosaur on display May 12, along with other specimens acquired from industry sites, in a new exhibit called “Grounds for Discovery.”1 The sedimentary layers at the mine where it was unearthed have plenty of plesiosaurs. That’s why Royal Tyrrell Museum of Paleontology’s curator Donald Henderson did not expect to find a land-dweller like a nodosaur among them.2 How did creatures from land and sea environments get mixed together? The Washington Post wrote that the nodosaur is so well preserved that it looks like a nodosaur statue.3 They shared the same speculation as National Geographic. Supposedly, a flood filled a riverbed and swept the dead nodosaur out to sea. 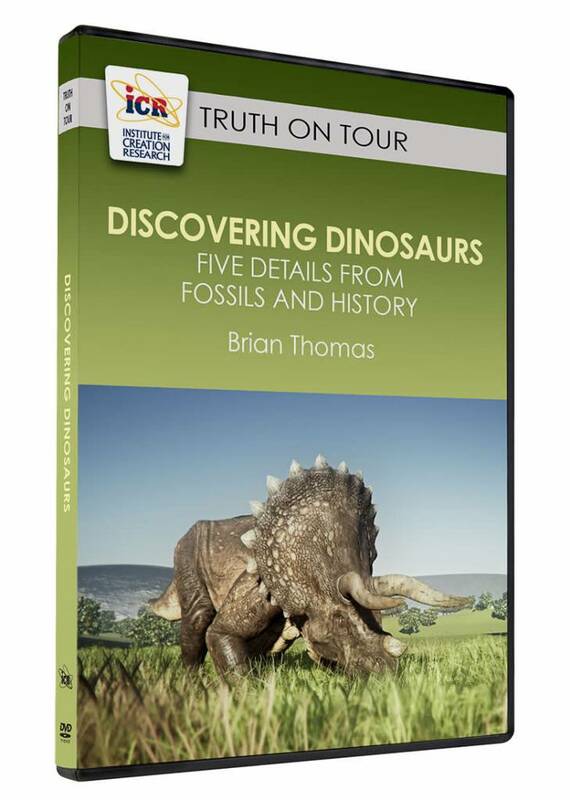 It sank to the sea floor and minerals quickly penetrated its skin and armor, “ensuring that the dead nodosaur would keep its true-to-life form as eons’ worth of rock piled atop it.”2 But how sensible does this story sound? Do animals die on riverbanks today without becoming food for scavengers? This nodosaur’s “Rosetta stone for armor” had no signs of tooth tears.2 Plus, plenty of water would be required to lift and transport an animal that weighs upwards of 3,000 pounds—the estimated weight of the nodosaur and the known weight of a female hippo. What are the odds that the nodosaur died right next to the river, didn’t get scavenged, and that a rare immense flood occurred immediately after and carried it out to sea? After getting flushed out to sea, how did fish, turtles, and other creatures including microbes continue to avoid the tasty nodosaur? Carcasses that reach today’s oceans soon bloat from microbe gases. Then they get picked clean. Just bones and flesh scraps fall to the sea floor, not whole carcasses. 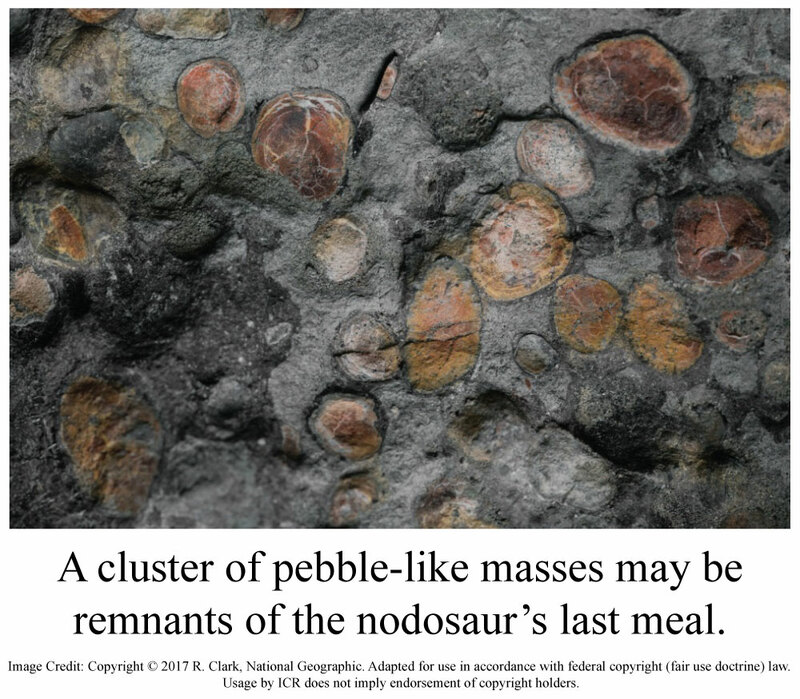 And this nodosaur’s stomach contents preserved bits of its last meal—bits that bacteria somehow never devoured. Speaking of the sea floor, minerals do not invade and preserve carcasses down there today. Nor do rocks or sediments cover and preserve them. Just the opposite happens. Specialized worms and crustaceans eat away 90-foot-long whale remains in mere months in warm waters. Ocean floors have mud, but no fossils. Something mixed large land animals with sea creatures, but it seems no aspect of this wacky river-to-ocean tale resembles reality. The high-quality nodosaur preservation, even of its skin, demands a quick and complete covering of sediments—and burial alongside sea creatures. Could the sea wash up on land so suddenly? If so, then it may have happened recently. Dinosaur-coloration expert Jakob Vinther, looking at the nodosaur’s skin pigments, told National Geographic that it is so well preserved that it “might have been walking around a couple of weeks ago. 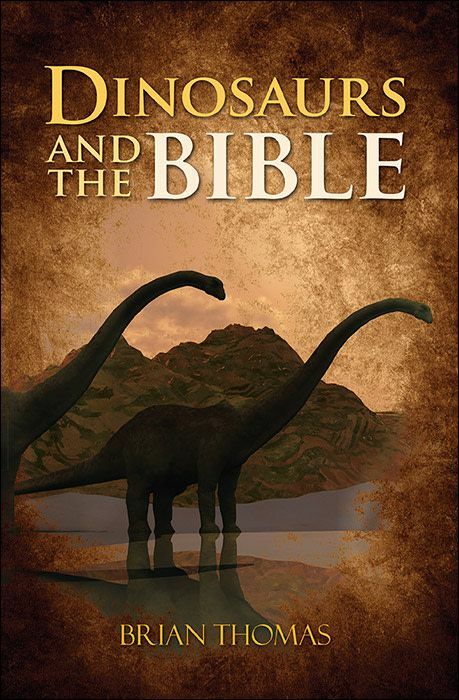 I’ve never seen anything like this.” Maybe it really was walking around much more recently than the 110 million-year age assigned to its sediments. After all, “sheaths once made of keratin—the same material that’s in human fingernails—still coat many of the osteoderms.”2 And keratin shouldn’t last even one million years. So far, this nodosaur’s secrets expose severe shortcomings with standard stories like getting washed out to sea for fossilization that doesn’t happen there, or skin and protein lasting millions of years. The Bible describes a watery catastrophe that could help solve these secrets. Who knows what other tales will need tailoring when research exposes more secrets from the world’s best-preserved nodosaur. Fact Sheet from Royal Tyrrell Museum: Current Exhibits, Grounds for Discovery. Posted on tyrrellmuseum.com, accessed May 12, 2017. Andrews, T. M. ‘Rare as winning the lottery’: New dinosaur fossil so well-preserved it looks like a statue. The Washington Post. Posted on washingtonpost.com May 12, 2017, accessed May 12, 2017. Image Credit: Copyright © 2017 R. Clark, National Geographic. Adapted for use in accordance with federal copyright (fair use doctrine) law. Usage by ICR does not imply endorsement of copyright holders.